We make this Italian-inspired loaf all year long, but our family and friends especially enjoy it during the holidays. Semolina flour is available in well-stocked supermarkets; if you can't find it, substitute yellow cornmeal. 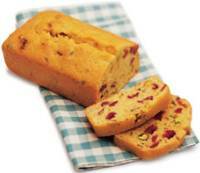 Semolina flour and olive oil give Italian character to tea bread flecked with cranberries and pistachios. 1. Butter and flour two loaf pans (3 1/2 x 7 1/2-inch each). 2. In a large bowl, mix 1 cup all-purpose flour, semolina flour, baking powder, and salt. 3. In another bowl, beat eggs to blend; whisk in sugar, olive oil, lemon peel, and vanilla and almond extracts. 4. Add egg mixture to dry ingredients and stir just until evenly moistened. Gently stir in cranberries and pistachios. Pour batter equally into prepared pans. 5. Bake in a 350° F (180°C) regular or convection oven until bread is golden brown and a wood skewer inserted in center of loaves comes out clean, 20 to 25 minutes. Cool bread in pans on a rack for 10 minutes. Run a knife between bread and pan sides, then invert pans to release bread; set loaves upright on rack. Serve warm or at room temperature. Loved it, though it was a little less sweet, Ithink tea cake/bread are supposed to be like that.